A whole life under water... 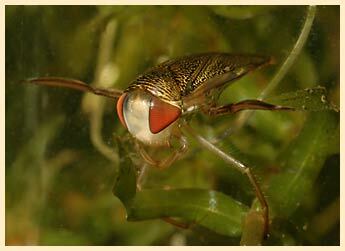 The lesser water boatman is totally adapted for a life under water. And that's where they live almost their entire life. Growing up, eating, mating and laying eggs - it all happens in the fourth element. Most of the time Corixa rests easy on the bottom with it's clawed mid legs, or is anchored to a water plant. Sometimes, when the bottom or the water plant isn't firm enough, and if the insect is lighter then water it will float up slowly like a balloon, then suddenly it rushes down again in search of a better spot. The body is kept more or less horizontal, a little tilted forward, possibly for the best balance with the upward thrusting bubble of air under the abdomen, which makes most species lighter then water. The hind legs are kept side wards, mostly with a rowing movement every second, as if the balance on the two mid legs just can't be reached. Sometimes the lesser boatman brushes the bubble of air with the hind legs, this improves the bubble's physical lung function. (More on the page: structure, abdomen). If the air in the bubble gets older, the movements intensify, so you will see this behaviour more when the lesser water boatman is under water half an hour or so. When the air supply is used up, the lesser water boatman rows in a flash to the surface, touches the surface with its back, head and body bend, creating a large gap of air between them. Less then half a second is sufficient to replenish the air supply and with high speed the bug rows down again. The body is cleaned often and thoroughly with the legs. The insect is able to fly very well and can make a sprint start: swimming quickly upwards it pierces the surface film and takes off immediately - few insect species are able to do this. They mostly fly at dawn and night. You can find the lesser boatman throughout the year. SUMMER At the end of spring the water gets warmer and the males of some species are starting to make chirping sounds (stridulating), it is for this reason that lesser water boatman also called water crickets. The modest sound is mostly noticed when the animals are kept in an aquarium or the like. On warm evenings when the air is full of electricity you hear a short and soft chirping, like a cricket, but somewhat lower pitched. A click on the photo on the left should start the sound (mp3, 34kb) of the pictured, about 7 mm sized Sigara (two males). Only the males have little thorns (palathorns) on the broadened foot (pala) of the front legs, which are (still) called stridulatory pegs because one thought that they were be rubbed over the ribbed snout, to generate the chirping. Later it was proved that not those thorns, but small grooves on the thigh (femur) are used to that purpose. It is remarkable that the females too have a ribbed snout. That the sound is meant to communicate is confirmed by the fact that many lesser water boatman species have hearing organs. 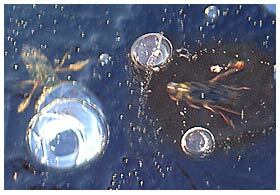 The lesser water boatman is not the only water insect making sounds, many beetles are able to do that. But for those sounds the purpose is to startle a possible predator. Hearing organs were not found on these beetles. The sounds are made by rubbing the abdomen against the under side of the hardened front wings. Especially the screech beetle (Hygrobia hermannii) is known for its name giving noises. Other water beetles that make creaking sounds when scared are the great silver beetle, the whirligig beetle and spercheus emarginatus. Mating is still going on: the animals grab each other and float up steer less winding to the surface... (That's my own observation, maybe there are others). The eggs are glued to water plants, mostly not in a layer, but one by one. Up till now I never saw them. It seems there are species in South America which lay so many eggs, that Indians used to put little branches in the water to be covered with this "caviar"! On the left a Corixa larva. Like all bugs, lesser water boatman have an incomplete metamorphosis, the newly hatched larva already have a strong resemblance with the adult(the imago) and are called nymphs. But you can recognise them by the wings which are not completely formed but are present as a short shield on the top which is called pterothorax (ptero = wing), so the uncovered top of the abdomen is visible. The first instar larva are heavier than water but have skin breathing so they don't need to go up for air. The last instar larva have the breathing habits of the adult. After several moultings the larva has become the adult insect in the autumn, at least if it's still alive, for it is good snack for many inhabitants of the water world, for example trouts. 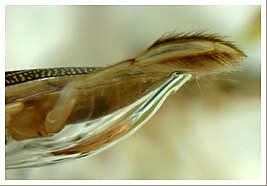 Many sports fishermen are acquainted with this fact and make game flies that resemble a Corixa. AUTUMN The last larva (nymphs) of the lesser water boatman moult to adults. For some species it is now prime time for chirping. WINTER Most lesser water boatman can survive the wintertime, even under a layer of ice: the animals row slowly underneath the ice in search of a trapped air bubble. They replenish their own air supply with the air of such a bubble and dive to the bottom again. This is shown on this composite photo, on the left with a larger bubble, on the right with a small one, there you can see vaguely the bent head. With even lower temeratures, they still can survive: as an extra bonus the (ice)cold water contains more oxygen which enhances the gas exchange between the water and their bubbles, which are somehow also larger then normal at these times and furthermore the animals keep still. Many migrate to streams that stay open and rest there in masses in the water plants. 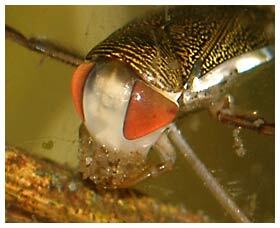 All lesser water boatman species have turned in the adult animal in the winter, except Micronecta. On the next page a little taxonomy of the species.